I’ve always loved hawks. When I was young, we often went on family drives in the country, and my mother would point them out, perched on the fence posts or in full and graceful flight above us. The first time I saw hawks up close was when I wrote an article on a modern falconer for Prairies North (eastend-falconer-marie-powell-prairies-north) and CBC Radio’s Afternoon Edition. A Swainson’s hawk became a focal point for this article, and my interest in the birds grew from there. During the first-draft stage of my novel Hawk, I wrote a scene with my main character Hyw seeing the world through a hawk’s eyeWelshs. After much revision, that scene became the opening scene of the novel. Hyw’s gift involves a kind of animal empathy that allows him to view the world through the animals around him, seeing through their eyes and knowing what they know of the world. Often I’m asked what hawk Hyw favors, but I deliberately chose not to name the hawks in the various scenes. Like other Welsh shape-shifters, Hyw is not limited to one particular type of animal or bird. I don’t want to limit the imagination of readers either. But I do have a clear picture in my mind of what hawks are involved. The hawk of this first scene would be the quick and fierce northern goshawk (pronounced “goose-hawk”), a favorite among falconers and often thought of as a “true hawk.” A medium-sized bird, it flies in dense woods as well as transitional areas where forest meets meadow, searching for other birds or mammals as prey. It’s common in Wales, and also found in North America and across Europe. These hawks have blue-black back feathers, red eyes and a white eyebrow. 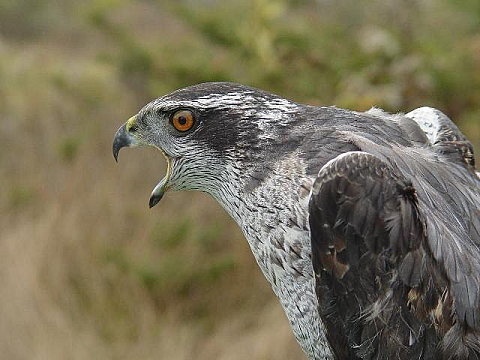 A true predator, this bird often flies silently and will hunt animals as large as snowshoe hares or chickens. Later in the book, Hyw channels the world through other birds. One I often call to mind is the sparrow hawk, a smaller and more common version of the goshawk. But the hawk I think of most often in relation to Hyw is the red kite. This is a large hawk with a wingspan of about two metres (about four and a half feet). It only weighs 2-3 lbs though, so it’s agile. It can hover in the air for many hours, barely beating its wings. It’s a chestnut red colour, with white patches under the wing, a grey head, and a forked tail. The red kite is a predator and a scavenger. It dines on everything from earthworms to small mammals and birds — and in one recent case, it swooped down to steal the food off of someone’s barbecue! Red kites were endangered by overhunting, but have been making a come-back in recent years. During the time of my novel, they would have been a very common sight in Wales. Have you ever seen a red kite, or any other hawks? What’s your favourite bird of prey? Leave a comment and let’s discuss it.